Two of the greatest mascots could star in the biggest launch game. Sega recently announced plans to publish another Mario & Sonic title, and once again, it'll contain a bunch of Olympic events. What's new for the 2012 London games? Soccer. Feel the excitement. The fact that this game (coming to both Wii and 3DS) exists is no surprise. The previous entries combined to sell nearly 20 million copies worldwide, and this success had little to do with consumer appreciation for the Olympics. People love seeing Mario and Sonic together. So why do Sega and Nintendo continue to tease everyone? 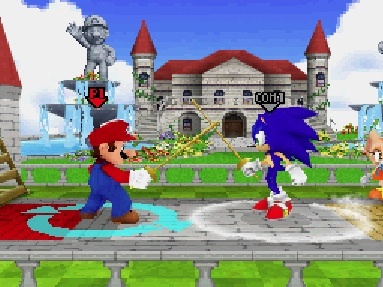 When Nintendo revealed Sonic as a playable character in Super Smash Bros. Brawl, the Internet was abuzz with speculation. A healthy partnership between both parties (after the publishers went at each other's throats during the infamous 16-bit war) gave fans hope that two of the most popular video game mascots would appear in one of the greatest crossover adventures of all time. OK, enough with the mini-games, Sega. Give the fans what they want. 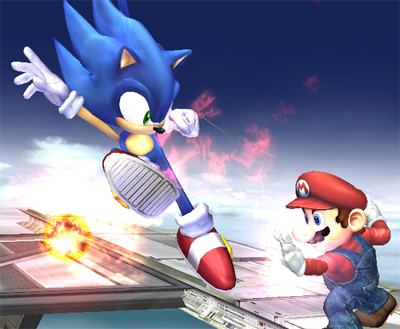 Instead of collaborating on this project, Nintendo allowed Sega to use its franchise characters in two Olympic themed video games available on Wii and DS, both of which received lukewarm reviews. Now a third's on the way, leading us to wonder if we'll ever see the Mario & Sonic platformer that would possibly dominate the competition. So here's what we're thinking: Project Cafe launch title with a 3DS counterpart. If the rumors are true, Nintendo has been busy showing its next generation console (codename Project Cafe) to third parties; some may already have development kits. We also heard that Rockstar may release the next Grand Theft Auto on the system. Something this big (the machine is supposedly more powerful than Xbox 360 and PlayStation 3) needs an equally huge launch game to move the hardware, and Luigi's Mansion 2 (while incredible to daydream about) won't get the job done. That said, now's the perfect time for Nintendo and Sega to finally design a full fledged Mario and Sonic video game that includes the best of both virtual worlds. We love having Sonic in Brawl, but it's kind of a tease. There would certainly be no need to craft a deep plot, since the story practically writes itself. How about a narrative involving Eggman and Bowser joining forces to obtain the chaos emeralds to crush the Mushroom Kingdom, and Mario and Sonic teaming up to save the universe from destruction? Makes sense to us. Bottom line, Nintendo will need to make a huge impact with Project Cafe, 3DS could use another high profile title and we're growing tired of awkwardly controlled mini games. Now imagine a shiny new Nintendo system, the most powerful console ever conceived, and right next to it, Mario & Sonic Adventure. Tell us you wouldn't buy that.